ZQuiet review: Snoring Mouthpiece at Walgreens Amazon Walmart? ZQuiet Review: Snoring Mouthpiece Price at Walgreens Walmart Amazon eBay Stores? Is snoring a problem for you? Is a snoring partner keeping you awake at night? According to the National Sleep Foundation, two thirds of partnered adults say their bed partner snores and 23% of those couples sleep in separate rooms because of snoring. While ZQuiet snoring device is available on the market as an option, does it really work to help get rid of our snoring problems? ZQuiet gave me this product to try in exchange for an honest review. How Does ZQuiet Work to Get Rid of Your Snoring Problem? With tissue vibration is one of the most notable causes of snoring, Mandibular Advancement Device (MAD) like ZQuiet has been designed to stop the snoring problem. The major idea of such mouthpiece design is that if you have a jaw that can’t slide backwards for one reason or the other (this has been discovered to be one of the major causes of throat blockage), air will likely move through your epiglottis and throat whenever you are sleeping. With this, Mandibular Advancement Device design is able to address the issue of throat blockage by helping to have your lower jaw held or to be in a position which is forward, depending on the mouthpiece design. Whenever air flow through your throat is maximized with minimum throat blockage, the snoring problem can be combated. The video below illustrates how does ZQuiet work to help address your snoring issue. There is airflow post in the contour cutout design which has been streamlined. This is what will make you breathe freely while you are sleeping. As stated earlier on, it aids mouth movement. This will enable you to sip water while it is still positioned in your mouth. When you have it inserted into your mouth, your lower jaw as well as tongue will be gently pushed. With this, your air passage will be opened up and snoring will be greatly alleviated. ZQuiet is made in the United States by a company called Sleeping Well LLC that is accredited by the Better Business Bureau with A rating. This anti-snoring device is designed by the company owners and sleep specialist Dr Avery Lieberman DDS. ZQuiet is a simple and effective device for anti–snoring. This mouthpiece will help to advance the jaw of an individual, have the airway widened to address your snoring issue. Its design has followed that of other Mandibular Advancement Devices. However, it has one feature which makes it to be very outstanding amongst others. This feature is referred to as Living Hinge Technology. The Living Hinge Technology enables an unique hinge at the back connecting the top and bottom pieces of ZQuiet device. With this design and the soft material used, natural mouth movement is well–aided by providing comfortable jaw mobility and allows natural mouth movement while wearing ZQuiet, no matter what sleep position its user is in. Through this unique patented technology adopted by zQuiet, the discomfort notable with other normal MADs will be eliminated for optimal comfort. Another of its major features is its 2 Step Comfort System. This implies that you are getting 2 unique mouthpieces of slightly different sizes for the price of one. Moulding is not required with ZQuiet. It has been designed to be compatible with different mouths and anyone can start making use it of straight of the bat as there are no technicalities involved. 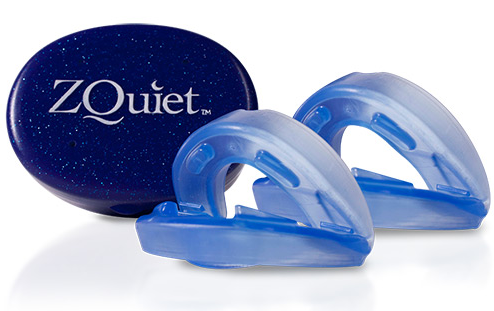 As most users need just a small jaw advancement while some snorer need a little more, the 2 ZQuiet mouthpieces of optimal sizes for jaw positions ensure the users receive a comfortable snoring solution with effective results. Is Mandibular Advancement Device like ZQuiet Safe To Use? ZQuiet is designated a class II medical device by the United States Food and Drug Administration (FDA), so it is validated as a safe and effective solution to treat snoring. With its usage, the lower jaw is advanced by some few millimeters. Through this, the tongue’s base which is blocking the airway will be prevented. This is what has been discovered to be the major cause of snoring. This anti-snoring mouthpiece is made of thermoplastic elastomer with BPA-free medical-grade material that have passed strict screening processes and consumer safety testing. Buy ZQuiet in Stores or Walgreens Walmart Amazon eBay? ZQuiet is designated a medical device by FDA, and this snoring mouthpiece is available for sale through the ZQuiet official website. For $9.95, you can try out this product for a period of 30 days. After tried and if you are not satisfied, you are free to have it shipped back without any additional charges. Even if you have had it trimmed, there are no implications as you are covered by the 30 days protection. If you are satisfied with ZQuiet, your credit card will be charged $79.95. This will make the total ZQuiet cost to be $89.90. ZQuiet Pro and Con Review: Any Complaints? When you have it tried out today, you will discover that it has got lots of outstanding features. Below are some of the key advantages of ZQuiet as a snoring mouthpiece which is growing in popularity amongst members of the public. ZQuiet has been approved by the FDA as class II medical device. Living Hinge Technology will have your jaw held forward but will still ensure that you are able to enjoy some freedom while moving your mouth. It has airflow posts which have the function of preventing your mouth from closing completely. This will aid you to breathe easily while you are asleep. Manufactured in the USA, and its design has been overseen by professional dentists. Its rubbery material which rest against the gums of users is soft. It does not contain any BPA or latex. It can be easily trimmed using a scissors if it happens to be large. It is ready for use. There are no special skills required to start making use of it. Its design has made it to be very durable. With the aid of soap and water, it can be maintained over a given period of time. It doesn’t have any hidden spot where bacteria will want to reside. ZQuiet offers a trial period of 30 days where you are to use it for free. The only investment that you are making is the shipping fee. ZQuiet is available to buy online for shipment globally, including countries like UK, Canada, Australia, Dubai, New Zealand, etc. When you start making use of it, you are likely going to experience soreness in your jaw within the first few days. You need to maintain a certain position of being awake while sleeping. Drooling may be experienced in the first couple of nights, though this is very common at the beginning stage for all first time users of Mandibular Advancement Device – until you get used to the mouthpiece. ZQuiet is not to be made use of when your mouth has undergone some oral work such as crowns, dentures and so on. The amount paid for shipping cannot be refunded. This is a designated class II medical device approved by FDA, in which it is a popular snoring mouthpiece with proven user results for men and women. What makes ZQuiet stands out is its patented Living Hinge Technology that provides optimal comfort, and its 2 Step Comfort System to ensure the users receive a comfortable snoring solution with effective results. This snoring device is available to buy online via the ZQuiet official website. ← Marz Sleep Spray Reviews: Ingredients For Better Sleep?